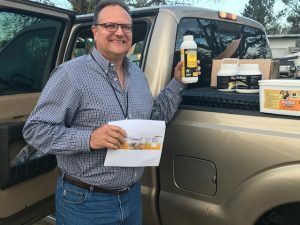 Jerry Hayes of Vita Bee Health has stepped up to help beekeepers in the Florida Panhandle following the third most intense Atlantic hurricane ever. 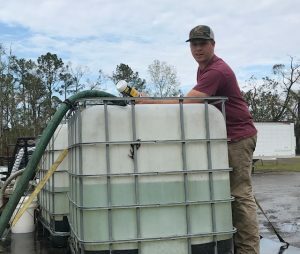 In October, an estimated 3000 honey bee colonies suffered the brunt of Hurricane Michael when it made landfall in the Florida Panhandle and blew its way north through the Carolinas. The main damage took a surprising form. 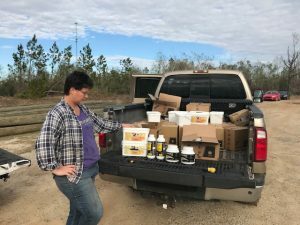 Although one commercial beekeeper reported losing 200 colonies mainly because the roofs came off in the hurricane leaving the colonies exposed to robbing, the danger for most beekeepers’ colonies was to be in the weeks following the hurricane. Tony Hogg, president of the Florida Beekeepers Association, explained that physical damage was not the main problem. Many hives survived, but the damage to pollen and nectar sources was huge.